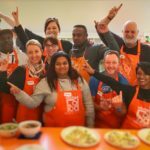 Wickedfood Cooking School recently hosted members of Tarsus to an afternoon of cooking. The participants all entered the cooking studio nervously as they found out soon enough that the team building activity for the day was a cooking class. Some cooks were super excited to show off the homely cooking skills while others hadn’t a clue where to even start. After the preparation and cooking of the meal the participants all sat down to enjoy the 3-course meal they had all helped prepare. The food was delicious and the participants loved the idea of a cooking team building activity. The cooks all left with a custom apron which was promised to be used in their kitchens at home. Wickedfood Cooking School also offers cooking lessons to hobby cooks wanting to learn more about all things food related. The cooking school offers all sorts of different cooking classes to all levels of cooks. Whether you are just starting out or been cooking for years, these cooking classes are sure to wet your appetite for more food knowledge.